The desire not to be a decadent society is a healthy one, and in that sense the Green New Deal deserves credit for looking at the American past and saying, in effect: Why not us, again? A conventional liberal, up until now, would dismiss that belief as simply paranoid, the product of Fox News feedback loops and the science-denying fever swamps. But the Green New Deal that Ocasio-Cortez and Massachusetts Sen. Edward Markey are sponsoring — and that four leading Democratic contenders for the presidency have already endorsed — responds by saying: Yes, that’s absolutely correct. It isn’t just that the Green New Deal proposes a 10-year plan for decarbonizing the U.S. economy that would involve the kind of “war socialism” unseen since, well, World War II (a model the authors explicitly evoke). It isn’t just that it dismisses all worries about deficits or inflation with a Venezuelan insouciance, or that it seems lukewarm about any policy or technology that might be tainted by capitalism or disliked by progressive interest groups. It’s also that the list of proposed policies for fighting climate change is filled with what even David Roberts of Vox, in the course of praising the Green New Deal, admits are “eyebrow-raising doozies,” with everything from universal health care to a job guarantee draped under the mantle of environmentalism. And that’s just in the official language of the (nonbinding, it should be noted) resolution: The Frequently Asked Questions that temporarily accompanied the New Deal’s rollout are even more striking in their green just means everything progressives want ambition. 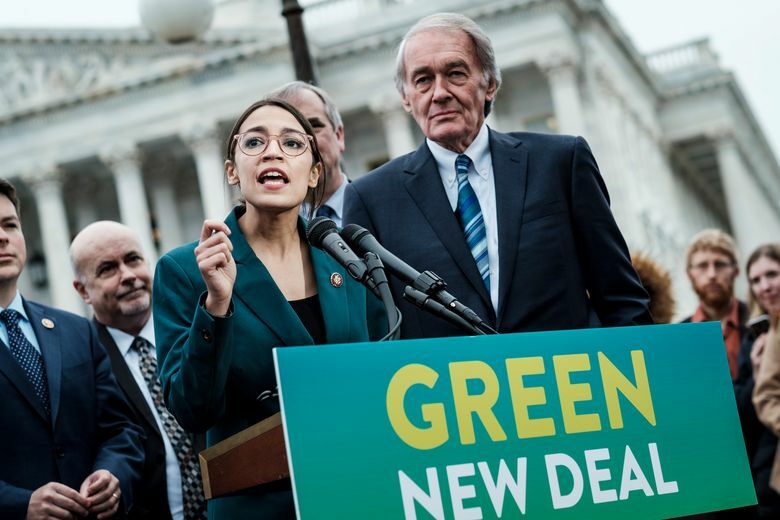 So there’s a pretty easy story to tell here about why, if the Democratic Party makes the Green New Deal vision its own, that shift will empower climate-change skeptics, weaken the hand of would-be compromisers in the GOP and put the kind of climate-change package that could win at least 51 votes in the Senate even further out of reach. And also possibly help President Donald Trump win re-election. But let me temper this critique by finding two positive things to say about the Green New Deal, which between them will add up to the single cheer promised in this column’s headline. First, in moving somewhat away from the long-standing centrist emphasis on pricing carbon — via carbon taxes or a cap-and-trade system — toward a focus on direct spending, the left might be moving away from theoretical efficiency toward political feasibility. This would point to a different zone of compromise from the one often debated up till now. Instead of centrist elites compromising to raise energy taxes that often fall heavily on the working class, you could imagine left-populists and right-populists compromising on adaptationist public works, on “big, beautiful” infrastructure projects (to borrow our president’s rhetoric) that don’t pretend to solve climate change but do mitigate its consequences. If the sweeping ambition of the Green New Deal leads to positive incremental change, I think that’s the most likely way it happens. But then I also want to mildly praise the resolution’s anti-incrementalism — because there are virtues in trying to offer not just a technical blueprint but a comprehensive vision of the good society, and virtues as well in insisting that dramatic change is still possible in America, that grand projects and scientific breakthroughs are still within our reach. They might not be, since the United States is presently decadent — with a stalemated politics, an aging and risk-averse population, a Balkanized culture — in ways that may limit our ability to re-create the specific projects of the past and preclude a regained conception of the common good. But the desire not to be a decadent society is a healthy one, and in that sense the Green New Deal deserves credit for looking at the American past and saying, in effect: Why not us, again? So that’s my faint praise. Enough, I hope, to earn my energy-efficient cabin an extra solar panel, bestowed by the beneficence of First Citizen AOC, in the utopia to come. Ross Douthat is a New York Times columnist.